A 63-year-old woman who was accused of targeting internet abuse at the family of Madeleine McCann has been found dead in a hotel. Brenda Leyland, from Burton Overy, Leicestershire, was accused of being one of the so-called "trolls" directing abusive messages at the McCanns. 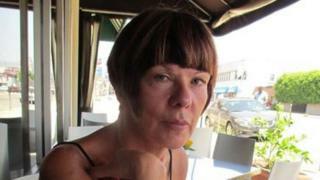 Her body was found days after she was confronted outside her home by a Sky News reporter. Madeleine McCann disappeared while on holiday in Portugal in 2007. Media captionPsychologist Dr Arthur Cassidy: McCann Twitter troll had "unusual background"
Mrs Leyland was confronted by the reporter who put to her she had posted messages attacking the family on Twitter via the handle @sweepyface. She replied: "I'm entitled to do that." A spokesman for Leicestershire Police said: "Police were called at 13:42 on Saturday 4 October to reports of a body of a woman in a hotel room in Smith Way, Grove Park [in Leicester]. "Officers have attended the scene and a file is being prepared for the coroner. The death is not being treated as suspicious." Sky issued a statement saying: "We were saddened to hear of the death of Brenda Leyland. It would be inappropriate to speculate or comment further at this time." A statement released by the Marriott Hotel in Leicester read: "We are very sad to confirm the death of a guest at the Leicester Marriott Hotel and our thoughts go out to the family and friends of the deceased." On Friday, Madeleine's father, Gerry McCann, told the BBC: "Clearly something needs to be done about the abuse on the internet. "I think we probably need more people charged." He described how he and his wife Kate, who live in Rothley, Leicestershire with their nine-year-old twins, did not read posts about them on the internet because it was too "upsetting". His interview on BBC Radio 4's Today programme followed the news police were reviewing a dossier of abusive messages about the family on social media, although the Met Police said nobody had been interviewed in connection with the investigation. In a list of thousands of tweets, apparently sent by Mrs Leyland, none of the messages are directed personally at the McCanns, who have "no significant presence" on social media. However, many are labelled with the hashtag #mccanns which allows them to be easily found and criticised the couple following the disappearance of their daughter. One read: "#mccann To Kate and Gerry, you will be hated by millions for the rest of your miserable, evil, conniving lives, have a nice day!" The account has since been deleted. Dr Arthur Cassidy, a psychologist who specialises in social media, said Mrs Leyland appeared to have a middle class upbringing which was unusual in trolling. He said: "In this particular case, her whole repertoire of trolling is slightly different from those of well-seasoned trolls because of her uniqueness and the way she has done this. "It would signify to me that she has been quite a novice at this." Dr Cassidy said typically, trolls sought and enjoyed a response from their victims but that did not appear to have been the case here. Mrs Leyland's son tweeted a tribute to his mum, writing simply: "I love you mum and I will miss you forever." Supporters of the 63-year-old have established a Facebook page, with several people posting tributes and condolences to her family.